Good morning! I have a card today that features lots of different products! I wanted to show you how I used one of the newly released adhesive sheets. I used two of the dies from Double Stitched Circle Dies (Large) to create a frame with Glossy Fine Gold Glitter Paper. On A2 white panel, I stamped the word ‘love’ from Bokeh Burst Heart with Noir Couture Color but with second generation stamping. To do this, I stamped off on scrap paper and stamped the second time onto the card base. 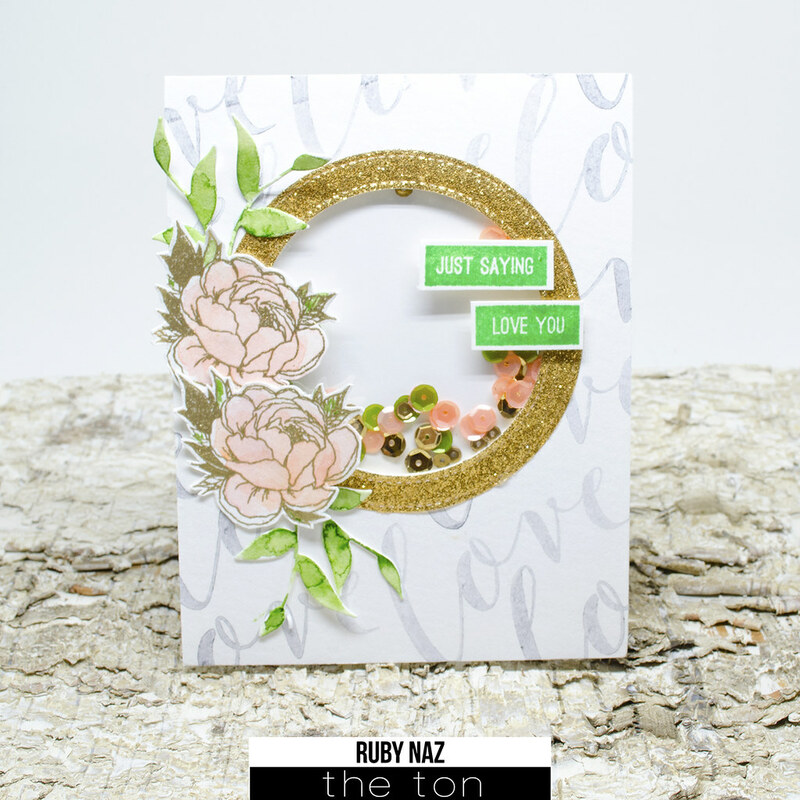 I used the inner circle (that I used to create the glitter frame) to die-cut the center part of the stamped panel. Then I glued down the glitter frame around it. Since I wanted to create a shaker card, I added a sheet of acetate behind the panel and then covered it with foam tape. 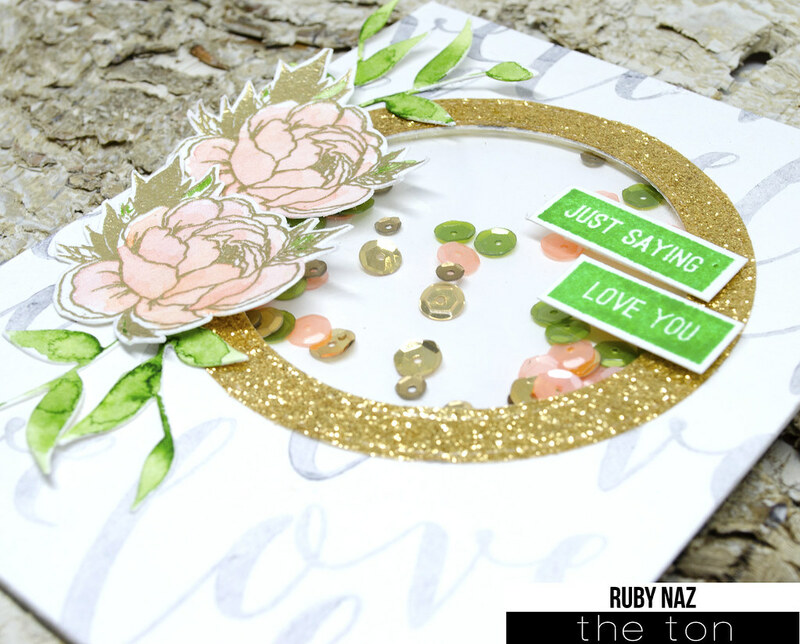 I filled the center with Secret Garden Couture Mix and glued the panel over a white card base. 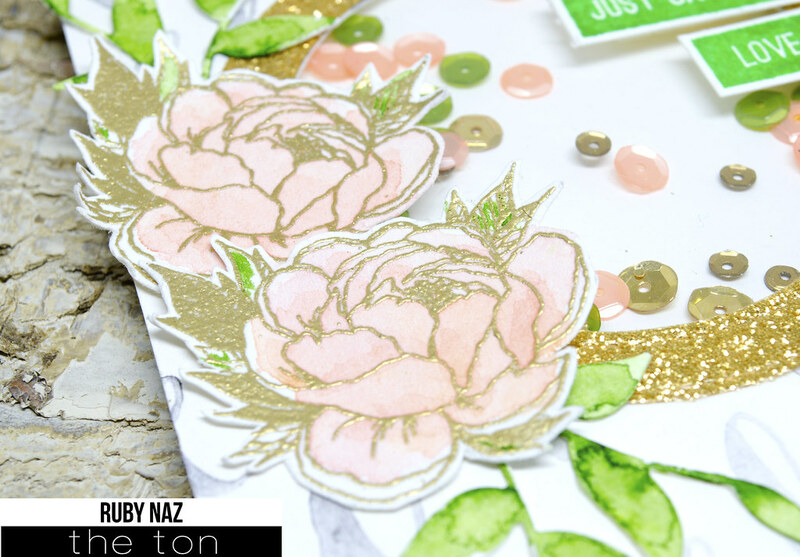 Separately, on white watercolor paper, I stamped the peonies from Sending Peonies with VersaMark and heat embossed with gold embossing powder. I fussy cut them and added some watercolors. 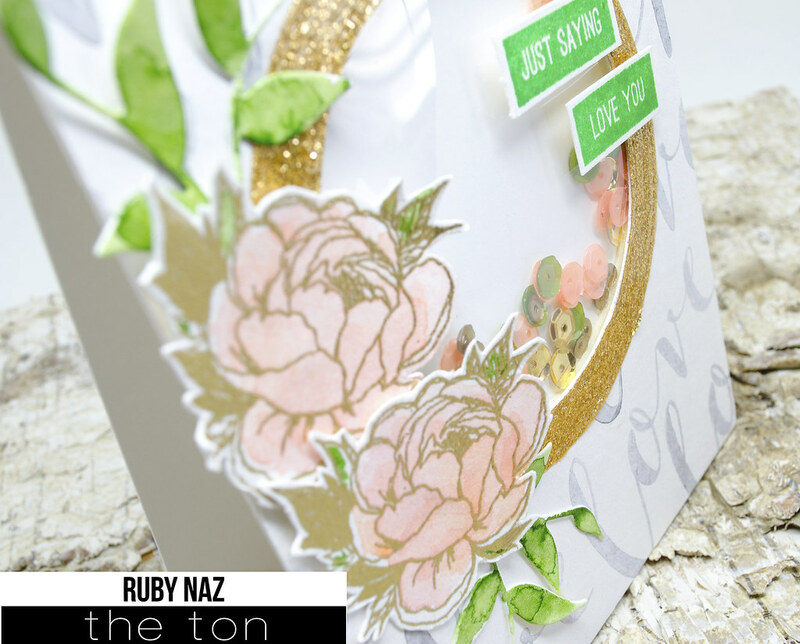 I used the leaves dies from Petal Cut Peonies Standalone Dies and cut watercolor paper. I added some green watercolors and arranged the peonies and leaves around the frame. I finished it off with some sentiments from Basic Labels, stamped in Bright Fern Dye Couture Color. Stripes, Polka Dots, and Peonies! I love it! Hugs to you! Ruby, it’s so beautiful! I love the soft peachy color with the green and golds, and I like how the leaves came out too! TFSAI. This card is just over-the-top WOW!!!!! Beautiful card Ruby. Love everything about it!